STUNNING QUAIL RIDGE WALKOUT RANCHER WITH A HUGE 40 ft RV GARAGE!! This immaculate custom built home features a grand entrance with almost 2,300 SF on the main floor, 11 ft trayed ceilings, stone fireplace, quartz counter tops, high end Wolf/Sub Zero stainless appliances & large master bedroom with a spa like ensuite!! The lower level features 2 additional bedrooms, a large rec room with wet bar & a 450 sf MEDIA ROOM!! At the rear of the home is a 40 ft driveway leading into the 40 ft x 14'4 ft RV BAY WITH A 13 ft HIGH DOOR complete with a 30 amp RV plug that could also be used as a SHOP!! 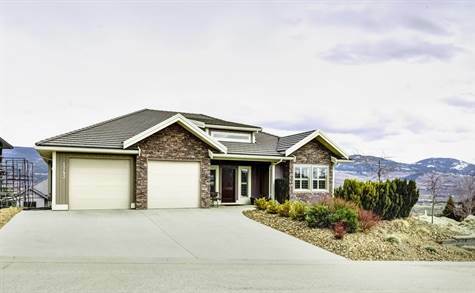 Other features include; a dual zone heat pump system, low maintenance yard, California shutters, built-in speakers, built-in vac, crown moldings and a covered deck with AIRPORT & VALLEY VIEWS! The airport, UBCO, QUAIL & BEAR CHAMPIONSHIP GOLF COURSES and the growing Airport Village amenities are only minutes away! !